Millions of people around the world throughout the ages have called on Lady Luck to help them win a bet or to change their fortune. If bets go wrong it’s because Lady Luck is not smiling on them. When bets go their way it’s the complete opposite and Lady Luck is sending good fortune their way. Superstitious or not there are lots of folks out there who believe in some sort of good luck. They may carry a ‘lucky rabbits foot’ with them. They won’t walk under ladders and they believe all their dreams have come true if they find a four leaf clover. Then there are those who believe black cats bring bad luck or that their life will be over if they break a mirror. So how far back does Lady Luck go? The greeks believed in the goddess Tyche which was around 323 BC. Yep, Lady Luck was around way back then. She was the daughter of Aphrodite and Zeus. One would think that a union of Zeus the Father of Gods, as far as Greek Mythology goes, and Aphrodite the goddess of love, would produce a lucky infant. Well in this case it was Tyche. 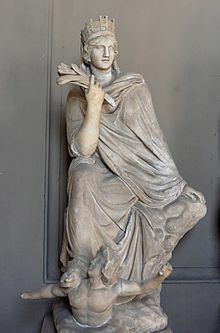 Usually anything that couldn’t be explained was attributed to Tyche.It was said that Tyche was the the spirit of fortune,chance, providence and luck. Depending what she was holding one would gauge the fate she would deal out. If holding a rudder she was said to be guiding the fate of the world.With a ball she represented the randomise of fortune. One never knew which way it would roll.Imagine if she was holding a football. AFL, not soccer. If carrying a cornucopia (Horn Of Plenty) associated with a good harvest, prosperity or spiritual abundance.Perhaps if she was our Lady Luck of sports she would be holding a baseball bat or something. 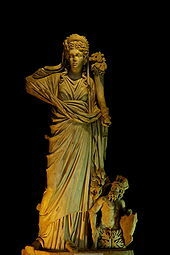 Fortuna the Roman goddess of luck has been around for many years. As the Roman goddess of luck she might bring good luck or bad. Gee, I wonder it that has anything to do with the fickleness of women in general. Anyway, it seems that instances of the Roman lady luck can be found as far back as 488 BC!Our Roman lady luck lasted right up to the middle ages. The wheel of fortune was actually attributed to Fortuna who would spin it randomly changing the fortune of those on the wheel. Some would gain great fortune while others may suffer misfortune. Can you imagine your fate depending on the spin of a wheel?There are some who say that Lady Luck favours the strong and bold rather than the week minded man. Perhaps that’s because they’re more likely to venture out to try something new. Whereas the weak tend to sit at home and vegetate. It seems our Lady Luck even ventures into the realm of superheroes! She made her first appearance in the 1940’s as a comic book insert in the newspaper of the times.While this lady luck didn’t have any super powers she brought bad luck to the villains of the time by using her detective skills and her prowess in Jujutsu. 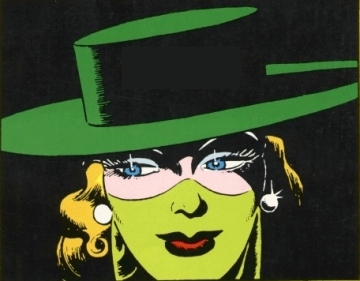 Lady Luck even made an impromptu appearance in May 2013 when she was introduced to DC Comic;s Phantom Stranger #6. 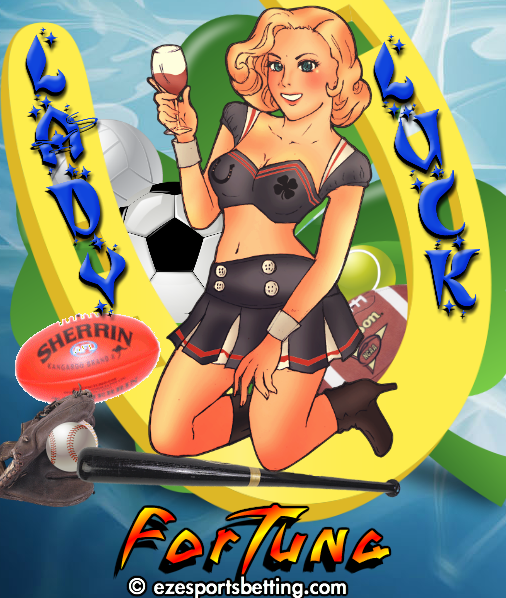 With all the history attributed to Lady Luck over the ages I thought it only natural that she should continue as the Lady Luck of fortune in the sports industry. If you still can’t work out which online betting site to join why not let Lady Luck pick one for you? While we don’t have a wheel of fortune to spin we do have the Page Refresh. Every time you refresh the page our Lady Luck, which looks exactly like the image to the left and is found on the bottom of this page, will randomly point to one of several online sports betting sites. You will find all those sites listed on the Fortuna Comes To EzeSportsBetting post. Whichever site you’re taken to is the site Lady Luck recommends you to join. I advise you to join more than one site. I say this for two reasons. If for whatever reason one site foes down, just as you’re about to place a bet you can use one of the other sites that you’re a member of. The second reason is so you can take advantage of any special deals they have to offer. Oh, there is actually a third reason, so you can choose the best odds before placing a bet. Seeing as there is no cost in joining you may as well join more than to take advantage of those points I just mentioned. If Lady Luck points to a online betting site that you’re a member of then you’re good to go. If not then she’s telling you you shouldn’t be placing a bet. joining more than one online betting site naturally increases your chances of placing a bet. It also increases your chances of getting the best odds as well as giving you the opportunities to take advantage of any specials individual betting sites have to offer.